Briggs, C. M., Piper, A. and Hernandez, R. (2014). Chikungunya ELISA Protocol. Bio-protocol 4(4): e1049. DOI: 10.21769/BioProtoc.1049. This protocol will result in the accurate qualitative measurement of anti-Chikungunya virus antibody (Ab) from infected mouse tissue or serum. This assay was developed by Dr. Caitlin Briggs, Arbovax, Inc. Chikungunya is a BL3 agent and should be handled in a biosafety level 3 laboratory under BL3 conditions. This protocol was used in the publication “Chikungunya virus host range E2 transmembrane deletion mutants induce protective immunity against challenge in C57BL/6J mice” (Piper et al., 2013). All of procedures A and B are performed at the BL3 level unless otherwise specified. Therefore every step involving live intact virus in unsealed containers must be completed inside a laminar flow biosafety cabinet, and the following preparative protocols should be observed before and after work is performed. Turn on UV light in hood for 5 min prior to beginning experiment. Turn off UV light and clean the area under the hood with Cavicide disinfectant. Remove all materials from the hood not needed for this experiment. Obtain clean waste receptacle containing enough bleach so that a full receptacle will have a final bleach concentration of 10%. Clean all materials going under the hood with Cavicide disinfectant prior to removal from the hood. Place media in 37 °C water bath to warm. Remove T-75 vented flasks containing BHK cells passaged 24 h prior to infection from 37 °C incubator with 5% CO2. Observe cell media for changes in color and clarity. Visualize cells under microscope at 20x maginification to check monolayer for irregularity, and confluence. Cells need to be 95%-100% confluent prior to infection. Pour media off flasks, and infect BHK cells with a multiplicity of infection (MOI) of 10 plaque forming units (pfu) per cell of CHIKV in 1 ml of completed 1x MEM (for infection follow Sindbis virus instructions in Hernandez et al., 2005). Rock flasks with virus at 25 °C for one hour. Add another 4 ml media to each infected flask. Place infected flasks in incubator set at 37 °C for one day. After 24 h, remove infected flasks from incubator. Transfer media from flasks into 50 ml conicals. Place conicals in gasketed buckets to spin, while still working inside the hood. Move sealed buckets to centrifuge, and spin cell media 10 min at 1,000 x g in bench top centrifuge to pellet cell debris. Inside the hood, transfer media to new conical tubes. While spinning cell media, prepare gradients inside the hood. Poured gradients: initial potassium tartrate step gradient. 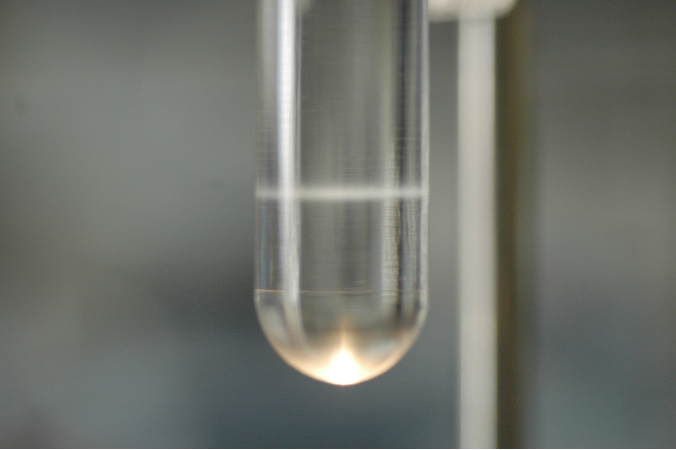 This gradient is formed by carefully layering 12 ml of 15% potassium tartrate onto a layer of 6 ml of 35% potassium tartrate in an ultraclear Beckman ultracentrifuge tube for SW28 rotor. Using a permanent marker, mark the interface of the two solutions on the outside of the tube. This will be approximately where your virus bands appear. Add 20 ml of harvested virus infected cell media to ultracentrifuge tube containing gradient gently, do not mix gradient. Must be an overlay. Place gradient tubes in Beckman rotor buckets. Balance buckets on a scale, using left over virus infected cell media to balance. Final weights must be within 0.03 grams of each other. Buckets containing virus must be sealed and cleaned with disinfectant prior to removal from the hood. Add buckets to rotor, and spin at 24,000 rpm, 4 °C overnight. Stop the spin, and place centrifuge buckets inside the hood. Shown (Figure 1) is the band of virus after the first spin. Note that the band is seen at the marked interface. The second gradient will be similar with a tighter band as seen below (Figure 2). There will be loss of virus however a second purification is necessary to remove most of the remaining contaminants. Set up test tube holder and a hand held light inside the hood. Place ultraclear tube in test tube rack. Using the hand held light, visualize your bands, which will be located near the interface of your gradient. Using a 25 ml pipet pull off top of gradient including all the completed medium. Using a 2 ml serological pipet, collect the virus band from the gradient, using the light to monitor the band. Dilute virus from the first gradient at least 1:2 with 1x PBS-D (Hernandez and Brown, 2010; Hernandez et al., 2005; Hernandez et al., 2010), for a total of 8 ml of virus. To a 17 ml Seton ultracentrifuge tube add 3 ml of 35% potassium tartrate, then overlay with 6 ml of 15% tartrate. Gently overlay with diluted virus from step 22 above, avoid mixing the gradient. Repeat steps A13-14 above for these gradients. 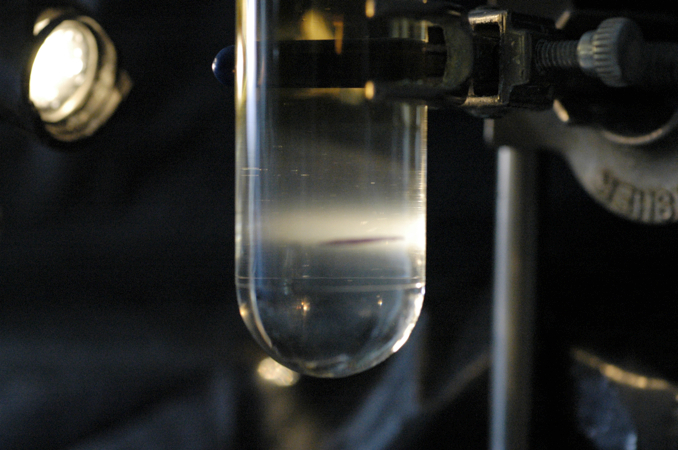 Spin tubes at 26,000 rpm for 4 h at 4 °C. Repeat steps A16-21, adjusting pipette size accordingly. Store collected live virus bands at 4 °C up to 2 weeks. The night before the assay, coat a 96-well NuncMaxiSorp plate by adding 100 ng/well of purified virus in 100 μl/well carbonate buffer. Seal plate with parafilm, and incubate overnight at 4 °C. The next morning, remove carbonate buffer + virus from plate by pipetting to avoid any additional risk of forming aerosols, and do not wash.
Block plate for 2 h with 100 μl/well blocking solution. Pipette off blocking buffer from plate, and do not wash. Dilute the mouse serum samples to be tested 1:100 in wash buffer, and add 100 μl diluted sample to each well of the plate (may need to try multiple dilutions to see which works best for your samples). Incubate for 1.5 h at 4 °C. Pipette off diluted serum samples, and wash plate 4x with 300 μl/well of wash buffer, removing old wash buffer before starting a new wash.
Add 100 μl of goat anti-mouse IgG HRP at a dilution of 1:2,000 in wash buffer. Incubate 1.5 h at 4 °C. Pipette off secondary antibody, and wash plate 4x with 300 μl/well of wash buffer. Do one final wash with 300 μl/well of wash buffer, sealing plate with parafilm and inverting plate prior to removing wash buffer. Combine equal amounts solution A and B from the ABTS Peroxidase Substrate System (KPL) in a conical tube, and add 100 μl/well to the ELISA plate. Incubate 15 min at room temperature. Stop reaction with 100 μl of 1% SDS (SDS will inactivate any live CHIKV still present in the plate, allowing for removal of the plate from BL3 conditions after this step). Read plate at 405 nm. Positive ELISA results are determined by significantly higher OD values when comparing samples from animals that should produce an immune response to those of mock animals. Statistical analysis should be performed to determine significance. You should not need to adjust pH. The protocol described here was used in the publication Piper et al. (2013). Hernandez, R. and Brown, D. T. (2010). Growth and maintenance of baby hamster kidney (BHK) cells. Curr Protoc Microbiol Chapter 4: Appendix 4H. Hernandez, R., Sinodis, C. and Brown, D. T. (2005). Sindbis virus: propagation, quantification, and storage. Curr Protoc Microbiol Chapter 15: Unit 15B 11. Piper, A., Ribeiro, M., Smith, K. M., Briggs, C. M., Huitt, E., Nanda, K., Spears, C. J., Quiles, M., Cullen, J., Thomas, M. E., Brown, D. T. and Hernandez, R. (2013). Chikungunya virus host range E2 transmembrane deletion mutants induce protective immunity against challenge in C57BL/6J mice. J Virol 87(12): 6748-6757. How to cite: Briggs, C. M., Piper, A. and Hernandez, R. (2014). Chikungunya ELISA Protocol. Bio-protocol 4(4): e1049. DOI: 10.21769/BioProtoc.1049.